Presenter Julie Burns leads NCTA members in stress reduction exercises at the December General Meeting. At the December 2013 NCTA General Meeting, members were introduced to a variety of techniques for reducing stress, just in time for the holidays! 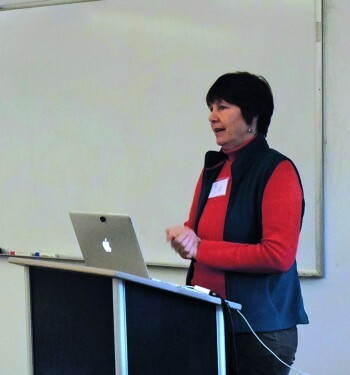 The final NCTA meeting of 2013 took place on Saturday, December 7th, at the San Francisco State University downtown campus. Despite the approaching holidays and competition from the holiday music playing in the mall below, the meeting saw a healthy turnout of translators and interpreters. After members enjoyed refreshments and some time to catch up, the meeting began with announcements concerning upcoming events, including information about the new NCTA webinars set to begin in January. We were also updated on the upcoming NCTA board elections, and were reminded that the time has come to renew our memberships to both the NCTA and the ATA. Following these announcements, Julie Burns, M.Ed., introduced the topic of her presentation, entitled Stress Busters for Translators and Interpreters. As a veteran ATA-certified Spanish<>English translator and interpreter with a passion for health and wellness, Julie has a unique insight into the ways stress can impact linguists specifically. She began her presentation by sharing an anecdote about stress from early in her own career, when as a young interpreter working at the Children’s Hospital in Boston, she found herself sobbing from emotional exhaustion after a long traumatic day of exposure to others’ pain and suffering. As translators and interpreters, we encounter various sources of stress in our workdays: tight deadlines, unreasonable demands from clients, poorly written or spoken sources, the expectation that we are walking bilingual encyclopedias. Julie pointed out some more subtle causes of stress for language professionals, such as information overload, environmental toxins, electropollution from wireless and electronic devices, and the aforementioned vicarious trauma. Electromagnetic frequencies (EMFs), which are produced by devices such as wireless networks and cell phones, may interact with the natural electrical circuits of the brain, possibly leading to symptoms of physical stress such as headache, fatigue, eye irritation, ringing in the ears, and sleep problems. In the short term, these symptoms can cause acute stress, characterized by an irregular heartbeat and the inability to think clearly or make well-planned decisions. Unrelieved acute stress may lead to chronic stress, which can cause long-term health problems and decrease overall life satisfaction. Learning about all of these harmful effects was quite stressful in itself. Thankfully, Julie shared four excellent tips on how to prevent or reduce stress for translators and interpreters. The first step is to identify the stress and its obvious or not-so-obvious source. Next comes the task of giving ourselves permission to feel better by getting enough sleep, eating properly, nurturing our minds through recreational activities or meditation, and reducing our exposure to EMFs. To do this, Julie recommends creating a ‘safe sanctuary’ in the bedroom by removing or at least unplugging all electronic devices (even using a battery-operated alarm clock) and darkening the room. She also suggests switching from a wireless internet connection to a wired connection, using a corded phone in place of a portable phone while at home, and activating speakerphone when using a cell phone. She taught our group a sequence of Japanese jin shin jyutsu techniques as a means of keeping stress at bay. The art of jin shin jyutsu is centuries old, and is based on the concept that life energy flows through the body. The Daily Clean Your House Flow, compiled by Deborah Myers of Health At Your Fingertips in Santa Rosa, incorporates jin shin jyutsu positions and focused breathing to center and balance the body’s energies. After participating in the exercise, several members reported feeling calmer and more relaxed. Finally, Julie led us through HeartMath’s Quick Coherence Technique, a method of activating the heart’s response to decrease stress. Many members, including myself, were surprised to learn that the heart has its own nervous system. The focused breathing and positive thinking of the Quick Coherence Technique promote release of oxytocin, a hormone involved in empathy and emotional bonding. The effects of the technique were clear when members remained smiling for several moments after participating. Learn specficl techniques for jin shin jyutsu, and other stress reduction tips here. kim posted this article under NCTA Meetings	on Thursday, May 1st, 2014 at 12:05 pm	You can follow any responses to this entry through the RSS 2.0 feed. Both comments and pings are currently closed.